Did the French have a fort on Sodus Bay seventy years before Sodus Point was founded by Captain Charles Williamson in 1794? Surprisingly, the answer is probably yes. There is no doubt that in the late 1600s and early 1700s, the French were aware of the strategic value of our bay in regards to their lucrative fur trade. In those days, our bay was referred to as “Bay of the Cayugas” by the French. What would the fort have looked like? The fort would have been relatively small for holding a small garrison of French Soldiers permanently or semi-permanently. It almost certainly would have been made from local trees which would be sharpened and used for the fort walls with some type of building for the troops in the center. 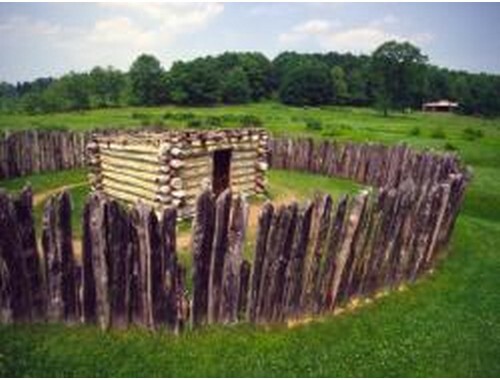 The photo below gives an idea of a typical small French Fort of this time frame. 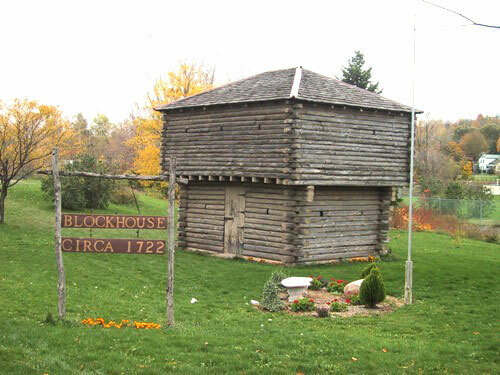 The central building may have resembled the famous blockhouse in Clyde, NY (pictured below) said to have been built by French trappers around 1722. Where would it have been located? The romance of the tract lies in the fact that it was discovered and claimed by the voyageurs of Champlain back in the middle 17 hundreds and selected by the King of France as a strategic point for a frontier fort. This very parcel of land was by royal grant given to the family of a French count and it has remained within that noble family until the present time. Only a few years ago, the Countess Bon Hemert, successor of the original grantee, died in France. During her life she refused to sell it. Upon her death the heirs agreed to dispose of it. This is how it becomes now available as a suburban home site. How long was it occupied? It most likely would have only been occupied for a few years. It undoubtedly would have been abandoned by Sept. 1760, after the French surrendered during the French and Indian War. There is no mention of such a structure in 1794 when Captain Williamson is surveying Sodus Point to become his vision of a major city on the bay. What evidence is there for the fort’s existence? The following information is from the book “Great Sodus Bay History, Reminiscences, Anecdotes and Legends” by Walter Henry Green (Sodus, N.Y. 1947) pp13-18. “Sir — Affairs are at such confusion here that I do not consider my soldiers safe. I send them to you to await me at your fort, because should things take a bad turn for us, I can escape alone more readily than if I have them with me. It is not necessary, however, to alarm Canada yet, as there is no need of despair. I shall be with you in twenty, or twenty five days at furthers and if I exceed that time, please send my canoe to Montreal. Letters for the General will be found in my portfolio which my wife will take care to deliver to him. If however you think proper to send them earlier, St. Louis will hand them to you. But I beg of you that my soldiers may not be the bearers of them. Calculating with certainty to find them with you when I arrive unless I exceed twenty five days. The Rev. Father de Lamberville has placed us in a terrible state of embarrassment by his flight. This letter indicates that there were some sort of defenses, possible as often has been suggested, a permanent fort at the Bay of the Cayugas as early as 1709, and at that time they were seriously menaced by some enemy. From the way Joncaire speaks of his soldiers it would seem that they were few in number perhaps only a company or possibly a regiment. From the above information, it seems there is little doubt that for some length of time, our area played host to a French Fort years before our village was founded in 1794.